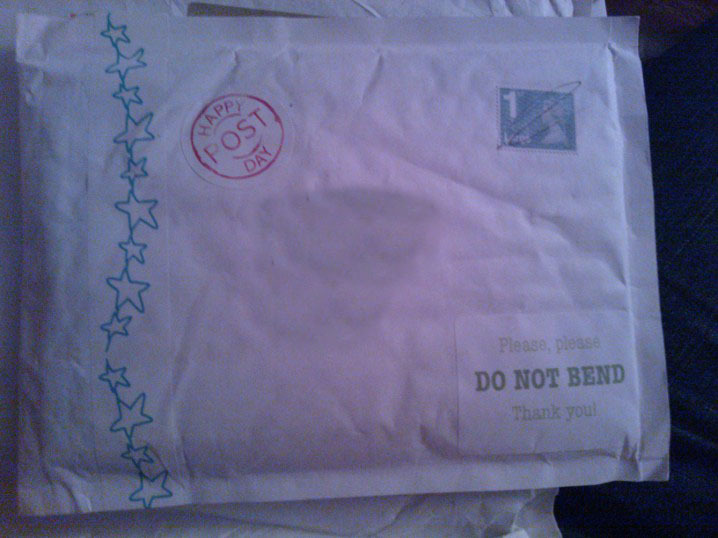 Before I show you what was inside the parcel, I will tell you a little bit about why I bought it. I have already shared with you on several occasions that I absolutely love receiving post…there is nothing quite like receiving a surprise through the letter box, whether it is a parcel of goodies or simply a lovely letter. A fellow blogger who shares my love of post is Claire at Claireabellemakes.com and she was the person who introduced me to Miss Beatrix’s #PostCircle. The idea of the post circle is that you will be put into a group of 6, who will then send post to each other. Every time you receive post from one of the members of the group, you pass on something to someone else in the group to keep the circle moving! I love the concept and it is another great excuse to get some exciting post! Obviously, I signed up the minute I heard about it! Last night I found out who was in my post circle group so now I’m all set to get started! Obviously though, to take part in the post circle, I need something exciting to send…and this is where my parcel comes in! I was hunting through Google for some pretty stationery, and that was when I encountered The Green Gables. The Green Gables is a British company who produces eco-friendly stationery, featuring illustrations drawn by Gabrielle Treanor. 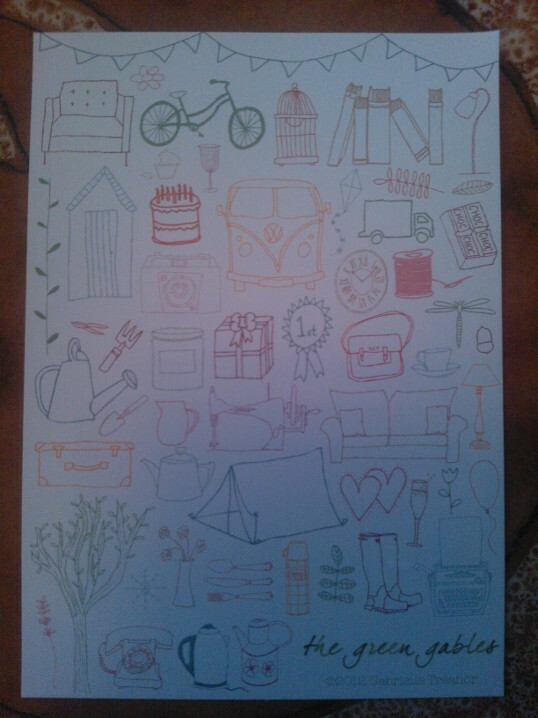 This adorable greetings card is about 12x12cm and I love the little VW design…we know how much I love them! The simple design of the card makes it ideal for anyone, which makes it a great choice for my post circle as I don’t yet know where this little card will be going. It comes in a choice of four colours (I chose the blue one) for £2.50 each or a pack of all four colours for £9. 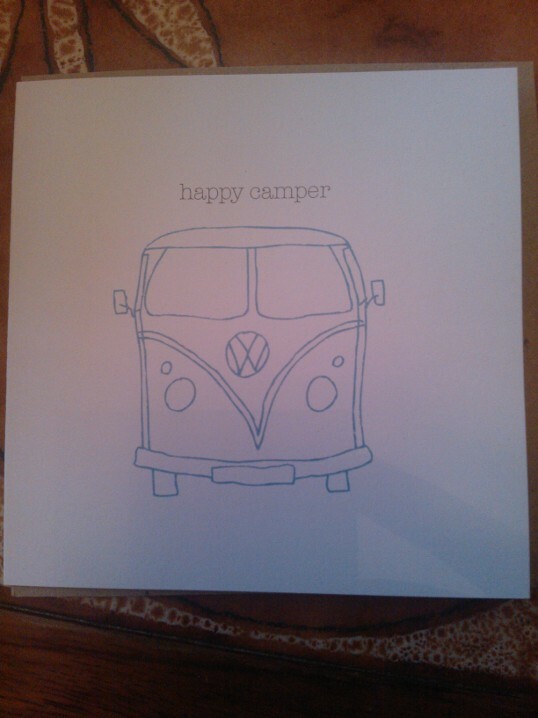 You can get your own Happy Camper card here! This is a pack of six vintage postcards that I got for the bargain price of £3.50! You can buy these as a mixed pack like I did, or buy a pack of six of the same design in different colours…whatever suits you! I fell in love with all of the designs though and I couldn’t cut it down to one choice! 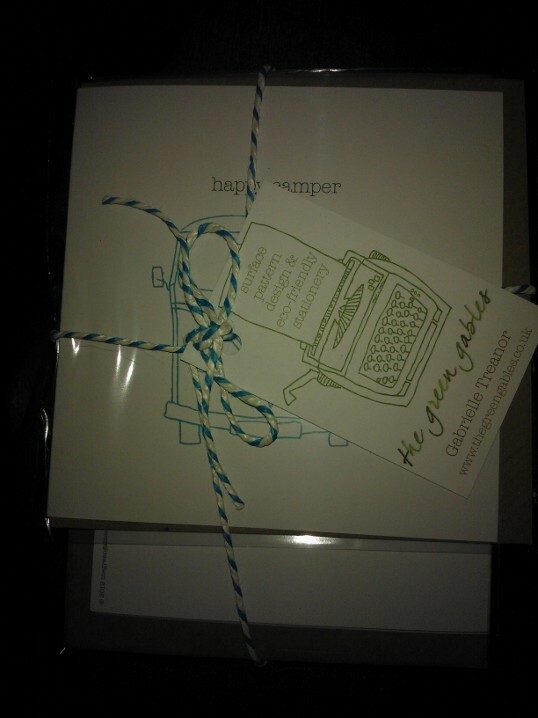 The postcards also come with envelopes which are made from beautiful, recycled paper. As it was tricky to photograph all of the designs in one photo, here are some close up images of the designs. 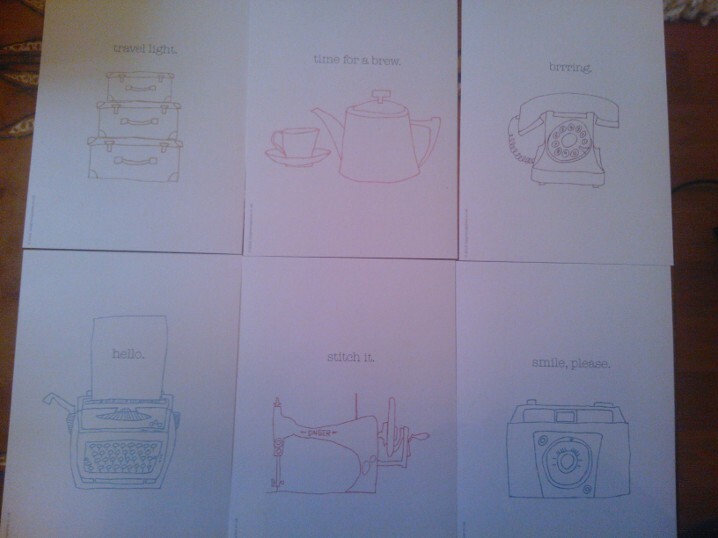 If you click on the image, it will take you to the bundle of postcards that matches the design. 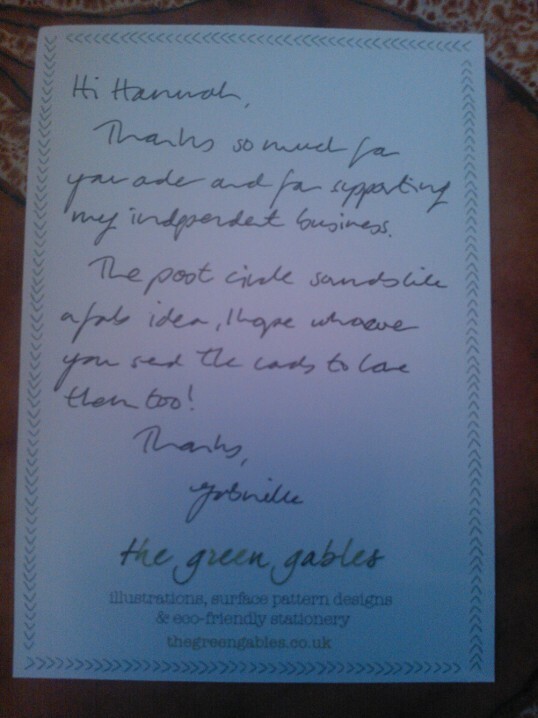 It is lovely to see that personal touch that you only get with independent businesses…it is clear to see that Gabrielle is obviously very passionate about her business and her customers. These sets include a large A5 notebook, a pocket-sized A6 notebook and the set of six matching postcards and envelopes. The other thing that I have my eye on is the stationery subscription box, which is a mystery box of stationery sent to you once a month, depending on how long your subscription is. You can find all of the information about the subscription box here. But this is only a fraction of what The Green Gables has to offer, so do go and see everything they have available! Yesterday I also read Pretty Little Things in a Box’s blog about swap sites that she had signed up to. While I have taken part in a few craft swaps before, I haven’t done any other swaps so it I was intrigued to look into the sites that she had signed up to. I have now joined Swap-Bot and Post Crossing and I am hunting down more swaps to join so I get even more post…it is a good job I have stocked up on post cards! Thanks for showing the 3rd package.. very artistic cards. I couldn’t resist them, I think they are lovely and I envy Gabrielle’s skill! Ooh I know! I’ve already sent my first post card off this morning! I can’t wait to see where the one I receive is from! Ooh definitely! I’m so excited to receive my first postcard! It’s surprising how little it costs to send a postcard abroad…definitely affordable for a student! I have signed up t my first two swaps on swap-bot too…I’m going to be busy! Trust me, the minute something arrives I will be sharing it on here! You just can’t beat it! Hi Zoe! I’m glad you like it! As soon as I saw you were a fellow sewing enthusiast I knew that it was destined to go to you! And this is who my card is from….